Some people enjoy hearing suggestions from others, as long as they are given kindly. For some this can be a bit annoying since they don’t want advice or suggestions when they didn’t ask for them in the first place. 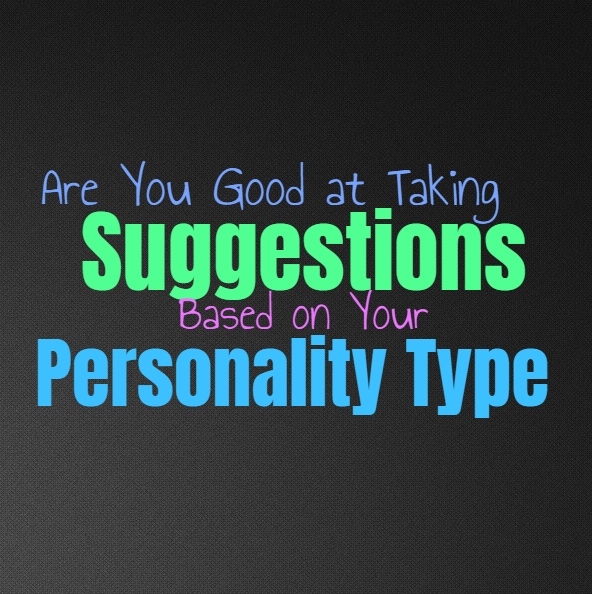 Here is how you feel about receiving suggestions or advice from others, based on your personality type. INFJs are actually fairly good at handling suggestions and they often enjoy hearing what other people think and feel. For them it depends on how these suggestions are delivered, and if they are don’t with passion and creativity, then this is something they enjoy hearing. They might not always utilize these ideas but they don’t usually become upset by hearing them. For the INFJ it is more about the other person and getting to learn about their mind and their ideas about certain things. ENFJs are often good at handling suggestions when they are delivered gently. If someone is simply trying to give their own opinion in order to help improve things, the ENFJ can tell where their intentions are. They know when someone is being pushy versus someone who is truly just excited to share their own ideas. They enjoy being around creative people and are certainly willing to hear their suggestions, even if they don’t ultimately use them. ENFJs are perfectionists and while they don’t often ask for them, hearing new ideas isn’t something they are going to be upset over. INFPs don’t mind taking suggestions, as long as it is in hopes of spurring more creativity. They can be a bit defensive about certain ideas and don’t really want to hear people giving suggestions which simply feel like criticism. Sometimes when people try to suggest something it makes the INFP feel as if they have done something wrong or failed, and so it isn’t always what they are opening to hearing at that time. When it comes to certain thoughts and ideas they are willing to hear other people out, but when it is something personal they really don’t care for it. ENFPs aren’t always great at taking suggestions, especially when it can feel like criticism. When they are focusing on something truly important and meaningful to them, the ENFP can struggle to really accept any suggestions from someone else. They need to make mistakes themselves before they can really hear others out, since most suggestions or ideas can naturally feel like criticism. For the ENFP it is okay to hear suggestions when they aren’t personally invested in something, but when they are it can be difficult for them. INTJs don’t mind hearing suggestions from people they trust and rely on, but from strangers it might be agitating. When they don’t solicit advice or suggestions, it actually feels a bit rude to the INTJ if someone tries to deliver their own ideas. INTJs don’t really want to hear people constantly trying to give them suggestions or criticism about things they didn’t ask their opinions on. They are welcome to suggestions at certain times and they will make their willingness to listen rather clear to those around them. ENTJs don’t mind suggestions from people they trust completely, since they often rely on these people for ideas. They are welcome to hearing them out because they already know them and realize that they can trust their opinions. When it comes to people they do not know trying to give them advice or suggestions about something, the ENTJ can actually become a bit annoyed by this. They are confident in their abilities and don’t really want new suggestions from people they aren’t sure they can completely trust. INTPs don’t mind suggestions most of the time, since they enjoy being able to feel inspired by new ideas. As long as someone is not intending this as critical and is simply excited to share their own ideas, the INTP will be open to this. They enjoy having someone they can bounce their own thoughts off of, and when someone brings something new to the table it can be truly rewarding for them. They are not incapable of hearing out someone else’s suggestions, especially if that person has unique thoughts to share. ENTPs are open to new suggestions, especially from people they find interesting and unique. When someone is capable of bringing in new and inventive ideas, the ENTP often enjoys hearing them out. They feel more inspired by someone they can bounce their thoughts off of, and this back and forth can actually be very rewarding for them. They don’t like stagnancy and so they don’t want to simply rely on themselves for imagination and inspiration. ISTJs can handle suggestions when they are useful and thoughtful, but otherwise they can become annoyed by them. Someone who constantly tries to suggest different ideas which don’t seem to be all that useful, can leave them feeling a bit frustrated. ISTJs are focused on being efficient and so they are open to people who can help them improve in this way. They simply don’t want to hear constant new suggestions which don’t seem to be all that helpful. ESTJs can handle suggestions when they are useful and going to help them improve. They can be a bit stubborn though and don’t really want to hear new suggestions from people they do not trust. They would rather listen to someone they respect and have faith in their intelligence, than someone they barely know. ESTJs want to focus on getting things done and so sometimes suggestions seem like a way to hold them back and prevent them from finishing a project themselves. ISFJs can be a bit defensive at times and so sometimes suggestions can feel more like criticism. They don’t mind taking new ideas when it is something they aren’t personally attached to, since otherwise it can be hard for them to really open up. ISFJs want to be capable of hearing people out and will do their best to listen, but deep down it might feel a bit offensive when someone makes suggestions that trample on their own beliefs. ESFJs want to be open to new suggestions and ideas, but sometimes it can feel more like criticism. When they are personally invested in something they might have a hard time really hearing what someone else wants to suggest. They don’t want to seem offended but they can be a bit closed off to these ideas when they are sold on their own path. ESFJs are more open to suggestions when it comes from someone they love and trust, but that doesn’t mean they will always take these ideas and use them. ISTPs are certainly open to suggestions when they are intelligently formed and useful. They don’t like constantly needing to turn to others for new ideas though, since they are naturally more independent people. They like to be open minded about things and will be more willing to take suggestions when the person giving them is using creativity and facts in order to come up with this new idea. ESTPs do enjoy hearing suggestions from the people they trust and respect, but often prefer this when they have asked for it. When someone continues to give their suggestions and advice even though the ESTP did not request this, they can become rather annoyed by it. There are times when they are open to new ideas, but there are other times when they want to stick to how they are doing things and really don’t want to hear someone else’s thoughts on the matter. ISFPs try to be open to new ideas and suggestions and are often willing to hear people out. They aren’t afraid to listen to what someone else thinks, this just won’t always be something they adapt themselves. ISFPs do enjoy suggestions when they are intended to be helpful or even inspirational, but they have their own beliefs and these can be hard to really change or adjust for the ISFP. ESFPs are willing to listen to suggestions when they come from someone they trust or respect. When they get to know someone and really enjoy their presence, then the ESFP actually likes being able to hear their thoughts and suggestions. They are willing to hear new ideas and constantly want to feel like they are experiencing different and new things in life.